Curved thick beams with smoothly variable cross-section size are very common in practical engineering problems. Designing the variable size based on the traditional finite element methods often leads to non-smooth solutions. To guarantee the smoothness of size distribution, an isogeometric analysis (IGA)-based design approach is proposed in this work to optimize the cross-section size of curved Timoshenko beams for natural frequencies. Due to the geometric exactness and high-order continuity of IGA, there is high accuracy of natural frequency prediction and sensitivity analysis for design optimization. It is found that small numbers of design variables lead to parameterization-dependent solutions, while large numbers of design variables induce design fluctuation. To avoid the undesirable design fluctuation, a stability transformation method-based K-S aggregation constraint scheme is proposed to regularize the size distribution and also achieve the stable convergence of optimal solutions. 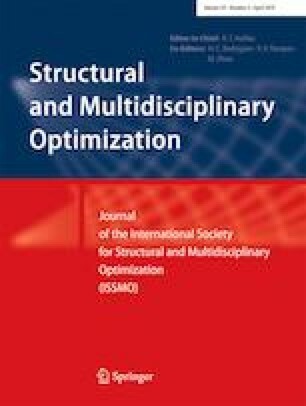 Multiple design studies including the deterministic and reliability-based optimization problems are performed to demonstrate the applicability and effectiveness of the proposed approach. The authors are grateful to Professor Krister Svanberg for providing his MMA code and the anonymous reviewers for their insightful suggestions and comments on the early version of this paper. This study was financially supported by the National Natural Science Foundation of China (Grant Nos. 11302041 and 11772079) and the Open Foundation of State Key Laboratory on Disaster Reduction in Civil Engineering (Grant No. SLDRCE17-03).